Acute inflammatory lung injury is often a delayed complication of critical illness and is associated with increased mortality. High mobility group-1 (HMG-1) protein, in addition to its role as a transcriptional regulatory factor, has recently been identified as a late mediator of endotoxin lethality. In the present studies, HMG-1 given intratracheally produced acute inflammatory injury to the lungs, with neutrophil accumulation, the development of lung edema, and increased pulmonary production of IL-1β, TNF-α, and macrophage-inflammatory protein-2. In endotoxin-induced acute lung inflammation, administration of anti-HMG-1 Abs either before or after endotoxin exposure decreased the migration of neutrophils to the lungs as well as lung edema. These protective effects of anti-HMG-1 were specific, because pulmonary levels of IL-1β, TNF-α, or macrophage-inflammatory protein-2 were not decreased after therapy with anti-HMG-1. Together, these findings indicate that HMG-1 is a distal mediator of acute inflammatory lung injury. Acute lung injury, called the acute respiratory distress syndrome in its most severe clinical manifestation, affects ∼150,000 patients per year in the U.S., with recent mortality rates being >30% (1, 2, 3). At present, there is no effective treatment. Acute lung injury often develops after the onset of injury or severe infection (4, 5, 6). The pathogenesis involves increased production of inflammatory mediators, such as TNF-α and IL-1β, and is characterized histologically by accumulation of large numbers of neutrophils and the development of interstitial edema (1, 2, 3, 6). High mobility group protein-1 (HMG-1)3 is a highly conserved protein with >95% amino acid identity between rodents and humans (7, 8). HMG-1 was initially characterized as a nonhistone nuclear protein that binds to the narrow minor groove of AT sequence-rich B form DNA. It has been implicated in the regulation of gene transcription and in stabilizing nucleosome formation (7, 8, 9, 10, 11). HMG-1 also is present in a membrane associated form, termed amphoterin, that mediates neurite outgrowth (8, 12). Amphoterin can interact with macrophage cell surface receptors for advanced glycation end products to enhance expression of tissue-type plasminogen activator (12, 13, 14). HMG-1 was recently identified as a late mediator of endotoxin lethality (15). Circulating levels of HMG-1 rose after the administration of endotoxin, and injection of HMG-1 itself was lethal. Abs to HMG-1 attenuated mortality associated with endotoxemia, even when the Abs were administered 2 h after the onset of endotoxemia, when the TNF peak had already occurred (15). Moreover, in patients with severe infection, increased serum HMG-1 levels correlated with nonsurvival (15). Because endotoxin and proinflammatory cytokine release is important in the mediation of acute lung injury (1, 2, 3, 4, 5, 6), we reasoned that HMG-1 might also be involved in the development and progression of this entity. The present experiments show that HMG-1 itself can cause an acute pulmonary inflammatory response, manifested by neutrophil accumulation, interstitial edema, and increased production of proinflammatory cytokines in the lungs. Anti-HMG-1 Abs attenuated endotoxin-induced lung injury, but not the early release of TNF-α and IL-1β, indicating that HMG-1 is a late mediator of endotoxin-induced acute lung injury. Male C3H/HeJ mice, 8–12 wk of age, were purchased from The Jackson Laboratory (Bar Harbor, ME), and BALB/c mice, 8–12 wk of age, were purchased from Harlan Sprague Dawley (Indianapolis, IN). The mice were kept on a 12-h light/dark cycle with free access to food and water. All experiments were conducted in accordance with institutional review board-approved protocols. Methoxyfluorane-anesthetized BALB/c mice received 5 μg Escherichia coli O111:B4 endotoxin (Sigma, St. Louis, MO) intratracheally (i.t.) in 50 μl PBS. Control mice were given 50 μl PBS i.t. without LPS. In experiments using anti-HMG-1 Abs, mice were given 0.2 ml preimmune (control) or postimmune (anti-HMG-1) rabbit antiserum i.p. either 30 min before and 12 h after LPS administration or 2 and 12 h after LPS administration. Rabbit anti-HMG-1 antiserum was assayed for specificity and titer to HMG-1 by ELISA and immunoblotting, as previously described (15). The anti-HMG-1 Abs contained in the antiserum reacted specifically with HMG-1 and did not cross-react with LPS, other bacterial proteins, TNF-α, or IL-1β. In these experiments, lungs were harvested 24 h after i.t. administration of PBS with or without endotoxin as indicated. Methoxyfluorane-anesthetized C3H/HeJ mice received 1, 10, or 100 μg HMG-1 i.t. in 50 μl sterile water. Control mice were given 50 μl sterile water i.t. without HMG-1. As a control, 1, 10, or 100 μg of rat albumin (Sigma) in 50 μl distilled water were given i.t., and no increases in lung myeloperoxidase (MPO), wet-dry ratio, or cytokine levels compared with control, unmanipulated mice were found 1, 8, or 24 h after such treatment. Recombinant HMG-1 was prepared as previously described (15), and contained <2.5 ng of LPS per μg of rHMG-1. Similar doses of HMG-1 have been given i.p. in previous studies (15) examining the systemic effects of this molecule. In the present experiments, lungs were harvested 8 or 24 h after the i.t. injections. MPO activity was assayed as reported previously (16). Excised lungs from three to four mice per treatment group were frozen in liquid nitrogen, weighed, and stored at −86°C. Lungs were homogenized for 30 s in 1.5 ml 20 mM potassium phosphate, pH 7.4, and centrifuged at 4°C for 30 min at 40,000 × g. The pellet was resuspended in 1.5 ml 50 mM potassium phosphate, pH 6.0, containing 0.5% hexadecyltrimethylammonium bromide, sonicated for 90 s, incubated at 60°C for 2 h, and centrifuged. The supernatant was assayed for peroxidase activity corrected to lung weight. All mice used for lung wet-dry weight ratios were of identical ages. Lungs were excised, rinsed briefly in PBS, blotted, and then weighed to obtain the “wet” weight. Lungs were then dried in an oven at 80°C for 7 days to obtain the “dry” weight. After the lung vascular bed had been flushed by injecting 5 ml chilled (4°C) PBS into the right ventricle, the lungs were homogenized for 30 s in lysis buffer containing 10 mM HEPES, 150 mM NaCl, 1 mM EDTA, 0.6% ipegal, 5 mM PMSF, 1 μg/ml leupeptin, 1 μg/ml aprotinin, 10 μg/ml soybean trypsin inhibitor, and 1 μg/ml pepstatin. The homogenates were centrifuged at 10,000 rpm at 4°C for 10 min, and the supernatants were collected. Protein content of the supernatants was determined using the bicinchoninic acid protein assay kit from Pierce Chemical Co. (Pittsburgh, PA). Immunoreactive IL-1β, TNF-α, and macrophage-inflammatory protein-2 (MIP-2) were quantitated using commercially available ELISA kits (R&D Systems, Minneapolis, MN). With these assays, the threshold of sensitivity for IL-1β and MIP-2 is 3 pg/ml, and that for TNF-α is 10 pg/ml. Control or HMG-1 mice were euthanized by cervical dislocation under methoxyfluorane anesthesia 24 h after i.t. injections, and then the chest was opened and the lung vascular bed was flushed by injecting 5 ml cold PBS through the right ventricle of the heart. The lungs were gently infiltrated through the trachea with 1% low melting point agarose (SeaKem, FMC Bioproducts, Rockland, ME) at 42°C. The lungs were removed en bloc and fixed in 4% paraformaldehyde, 0.23 M sucrose solution overnight. Tissue was then embedded, and 5-μm sections were prepared for staining with Gill’s hematoxylin (Fisher, Springfield, NJ). To limit variability and provide appropriate controls, for each experimental condition, groups of animals were prepared and studied at the same time. For each experimental condition, mice in all groups had the same birth date and had been housed together. Separate groups of mice (n = 3 to 9 per group) were used for MPO assays and cytokine analysis. Data are presented as mean ± SEM for each experimental group. One way ANOVA and the Tukey-Kramer multiple comparisons test was used for comparisons between data groups. p < 0.05 was considered significant. In previous experiments (15), high doses of HMG-1 (i.e., 500 μg) were lethal to mice. Lower doses (10 to 50 μg/mouse) produced signs of endotoxemia, including lethargy, piloerection, and diarrhea, but the organ-specific effects of HMG-1 were not specifically examined. To determine whether HMG-1 might induce acute lung injury, we administered HMG-1 i.t. to C3H/HeJ mice and then determined lung MPO and wet-dry ratios 8 or 24 h later. Lung neutrophil accumulation was increased in a dose-dependent manner 8 h after HMG-1 administration, starting with doses as low as 1 μg/mouse (Fig. 1⇓A). Further increases in lung MPO were present 24 h after HMG-1 exposure (Fig. 1⇓B). Lung edema, as measured by wet-dry ratio, was significantly increased 8 and 24 h after HMG-1 administration, compared with controls (Fig. 1⇓). These effects could not be attributed to the trace amount of endotoxin coadministered with the HMG-1, because C3H/HeJ mice do not respond to low doses of endotoxin. HMG-1 increases lung neutrophil accumulation and edema in C3H/HeJ mice. MPO concentrations were assayed in lungs from control mice and from mice given 1, 10, or 100 μg HMG-1 i.t. 8 h (A) or 24 h (B) previously. The relative increase in lung wet-dry ratios as compared with control unmanipulated mice was determined in mice given 1, 10, or 100 μg HMG-1 i.t. 8 h (A) or 24 h (B) previously. The increase in wet-dry ratio was calculated by subtracting the mean value for control, unmanipulated animals from the value obtained in each HMG-1 treated mouse. ∗, p < 0.05, ∗∗, p < 0.01, and ∗∗∗, p < 0.001 vs control. Tissue levels of IL-1β, TNF-α, and MIP-2 were significantly elevated in the lungs after administration of doses of HMG-1 as low as 1 μg/mouse (Fig. 2⇓). Histological examination of tissue sections prepared from the lungs of animals treated with 100 μg HMG-1 24 h previously revealed evidence of an acute diffuse inflammatory response, with accumulation of neutrophils in the interstitial and intraalveolar areas, interstitial edema, and protein exudation into the alveolar space (Fig. 3⇓). These pathological changes are typically observed in response to acute lung injury mediated by endotoxin, TNF-α, and other proinflammatory stimuli (6, 17, 22, 23, 24). Because the doses of HMG-1 applied here fall within the pathologically relevant range seen in sepsis patients or endotoxemic mice (15), these findings provide direct evidence that HMG-1 can participate in the mediation of acute lung injury. HMG-1 increases proinflammatory cytokine concentrations in the lungs. Lung homogenates were obtained from control, unmanipulated mice and from mice given 1, 10, or 100 μg HMG-1 i.t. 24 h previously. ∗, p < 0.05, ∗∗, p < 0.01, and ∗∗∗, p < 0.001 vs control. Effects of HMG-1 on lung histology. Sections from the lungs of a representative control, unmanipulated mouse (A) and from a mouse given 100 μg HMG-1 i.t. 24 h previously (B) are shown. The pulmonary histology in HMG-1-treated mice shows accumulations of interstitial and intraalveolar neutrophils, interstitial edema, as well as leakage of fibrin and RBC into the alveolar space, consistent with acute inflammatory injury. A widely used model of acute lung injury is intratracheal administration of endotoxin (17). This model is characterized by a pulmonary inflammatory response with neutrophil infiltration and early increases in proinflammatory cytokines, including TNF-α, IL-1β, and MIP-2. Treatment of mice with anti-HMG-1 Abs either before or after endotoxin administration significantly decreased endotoxin-induced neutrophil accumulation into the lungs (Figs. 4A⇓ and B). Further, passive immunization of mice with anti-HMG-1 Abs before or after endotoxin exposure significantly attenuated the severity of lung edema produced by intratracheal instillation of endotoxin (Fig. 4⇓). It was theoretically possible that the protective effects of anti-HMG-1 were due to decreasing the expression of TNF-α, IL-1β, and MIP-2 in the lung. However, anti-HMG-1 treatment had no effect on endotoxin-induced increases in IL-1β, TNF-α, or MIP-2 protein concentrations (Fig. 5⇓). Thus, the protection by anti-HMG-1 in endotoxin-induced acute lung injury is specific. 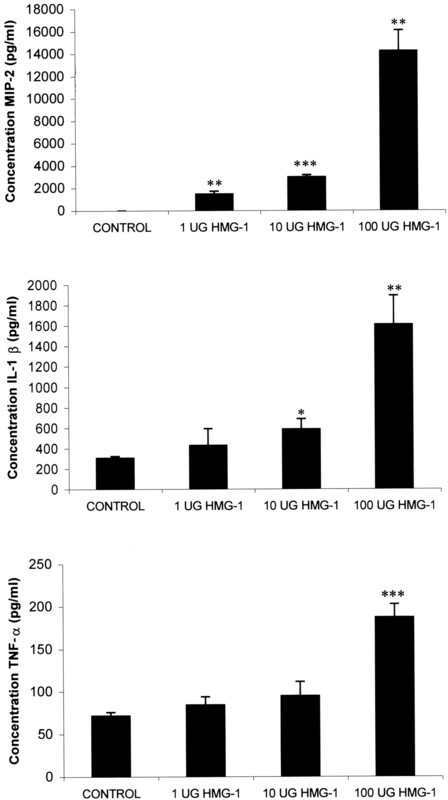 These results demonstrate that HMG-1 is a mediator of acute inflammatory lung injury. Anti-HMG-1 Abs decrease neutrophil accumulation and lung edema in BALB/c mice treated with intratracheal endotoxin. Lung MPO levels were assayed 24 h after the administration of 5 μg LPS i.t. in mice treated i.p. with either 0.2 ml preimmune rabbit serum (LPS) or anti-HMG-1 serum 30 min before and 12 h after i.t. LPS (A) or 2 and 12 h after i.t. LPS (B). MPO levels from control, unmanipulated mice are also shown. The relative increase in lung wet-dry ratios as compared with control unmanipulated mice was determined 24 h after the administration of 5 μg LPS i.t. in mice treated i.p. with either 0.2 ml preimmune rabbit serum (LPS) or anti-HMG-1 serum 30 min before and 12 h after i.t. LPS (A) or 2 and 12 h after i.t. LPS (B). ∗, p < 0.05 and ∗∗, p < 0.01 vs control. Anti-HMG Abs do not affect endotoxin-induced increases in lung proinflammatory cytokine levels. Lung homogenates were obtained 24 h after the administration of 5 μg LPS i.t. in mice pretreated i.p. with either 0.2 ml preimmune rabbit serum (LPS) or anti-HMG-1 serum 30 min before and 12 h after i.t. LPS. Endotoxin administration resulted in significant increases in pulmonary concentrations of MIP-2, IL-1β, and TNF-α compared with control, unmanipulated mice. There were no statistically significant differences in cytokine levels between endotoxin-treated mice given preimmune or anti-HMG serum. HMG-1 has recently been identified as a late mediator of endotoxin lethality, because its systemic release during endotoxemia is delayed as compared with the rapid increase of the early proinflammatory cytokines, such as IL-1β and TNF-α (15). The present experiments show that the delayed release of HMG-1 can participate in the downstream development of lung injury. This role of HMG-1 in the pathogenesis of acute lung injury appears to be distinct from any effects on earlier acting proinflammatory cytokines. In particular, despite the ameliorative effects of anti-HMG-1 Abs on the development of lung injury and neutrophil accumulation, endotoxin-induced increases in pulmonary concentrations of IL-1β, TNF-α, and MIP-2 were not affected by inhibiting HMG-1. Previous studies (18) demonstrated that proinflammatory cytokines, including IL-1β and TNF-α, induce production of HMG-1. The present findings are consistent with HMG-1 being a distal inflammatory mediator, with delayed release after cellular exposure to endotoxin or, more likely, with release induced primarily by proinflammatory cytokines, such as IL-1β and TNF-α, the expression of which is rapidly increased by endotoxin. Although anti-HMG-1 treatment significantly decreased lung edema and neutrophil accumulation, such therapy did not completely ameliorate the development of lung injury as compared with controls. These results indicate that whereas HMG-1 participates in endotoxin-induced lung injury, other mediators also are involved. It is likely that IL-1β, TNF-α, and MIP-2 participate in the early development of acute lung injury (3, 6, 16, 19, 20, 21); the levels of these mediators were increased in the lungs of endotoxin-treated mice even when anti-HMG-1 was administered. Blockade of each of these cytokines ameliorates endotoxin-induced lung damage (17, 22). Instillation of IL-1β, TNF-α, or MIP-2 into the lungs leads to neutrophil accumulation, interstitial edema, and histological changes consistent with inflammatory injury (23, 24). These proinflammatory cytokines are present in bronchoalveolar lavage specimens from animals or patients with acute lung injury (17, 19, 20, 21, 22, 23, 24, 25). The delayed kinetics of HMG-1 release, associated with its contributory role in acute lung injury, point to HMG-1 as a potential target for therapeutic intervention. However, because inhibition of HMG-1 does not completely prevent inflammatory injury to the lungs, it is likely that effective strategies for acute lung injury should focus on inhibiting the pathological effects of both early (e.g., TNF-α and IL-1β) and late (e.g., HMG-1) mediators. ↵1 This work was supported in part by National Institutes of Health Grants HL50284 and HL62221 (to E.A.). ↵3 Abbreviations used in this paper: HMG-1, high mobility group protein-1; MIP-2, macrophage inflammatory protein-2; i.t., intratracheally; MPO, myeloperoxidase.